This month we have well-known author Hazel Edwards, author of Sir Edward 'Weary' Dunlop and 200 other books (including There's a hippopotamus on our roof eating cake). 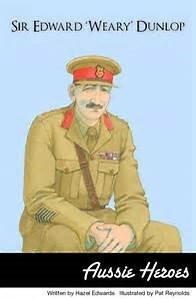 In Sir Edward 'Weary' Dunlop Hazel Edwards explores why this wartime surgeon and rugby-player, is so well regarded. Melbourne born, farm boy 'Weary' was fascinated by medical science and sport. In November 1939, after the outbreak of WWII, Weary signed up for the Australian Army. In April 1942, Weary and his men became prisoners of war. Weary's leadership against the Japanese prison guards was heroic. He saved lives through his medical skills, negotiated on behalf of his men, and persuaded the Japanese it was in their interests to have healthier prisoners. Read his story to find out how he survived the war and led a successful medical career afterwards. Sir Edward 'Weary' Dunlop is part of the Aussie Heroes series, which introduces junior readers to heroes who have made an important contribution to Australian society. Aimed at readers 10 plus New Frontier Aussie Heroes series include Weary Dunlop, Dr Fred Hollows and Edith Cowan , the quiet woman of note. Download a teaching resource to go with the Aussie Heroes series: What Makes a Hero? Discussion Activity Use these points to discuss your hero. Here are some reviews of Sir Edward 'Weary' Dunlop online. abc_radio_krista_bell_reviewing_weary.doc 'written in child-friendly mode'. Need to Read This! : featured authors & books such as our 'Sir Edward 'Weary' Dunlop'. New Frontier Publisher Blog Relative Heroes and sharing an author's poignant moment. NSW Assoc for Gifted & Talented reminds readers that heroes were once children. A very readable account. Hazel's book about Edith Cowan features another person who helped the war effort. Edith Cowan was involved behind the scenes in the Red Cross organising assistance for the troops and families on their return from WW1. She was against international war but practical about what she could do. She was also the first woman elected to parliament. In 1920 she received an OBE for her services during WW1; coordinating the care for returned soldiers. You can find her on a $50 note. 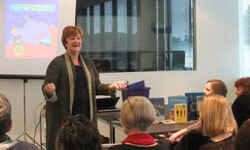 Listen to Hazel Edwards talk about her books with Jen Storer.